When Australia were going through their recent (relatively) dry patch, there was much talk of them having lost their ruthlessness. 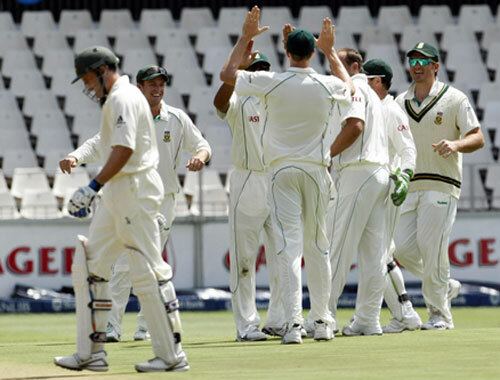 Mitchell Johnson certainly hasn’t lost his, as he demonstrated today – reducing South Africa to 0/2 (that’s two wickets for no runs, for backwards-scoring Aussie readers) and effectively taking another wicket by injuring Graeme Smith to the extent that the South African captain will be out for two or three weeks. 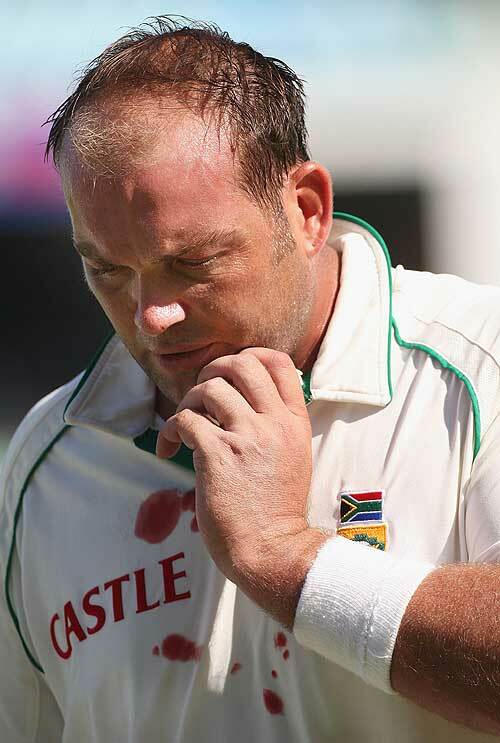 Johnson also drew blood from Jacques Kallis after hitting him on the jaw with what is often referred to as a ‘snorter’, or even a ‘ripsnorter’, of a ball. Such has been Australia’s resurgence in this series, and their dominance of this Test so far, that questions may soon be raised about whether the Saffers, having wounded Australia in December, have once again flattered to deceive. South Africa and Australia certainly know how to get cricket fans on the edge of their seats. 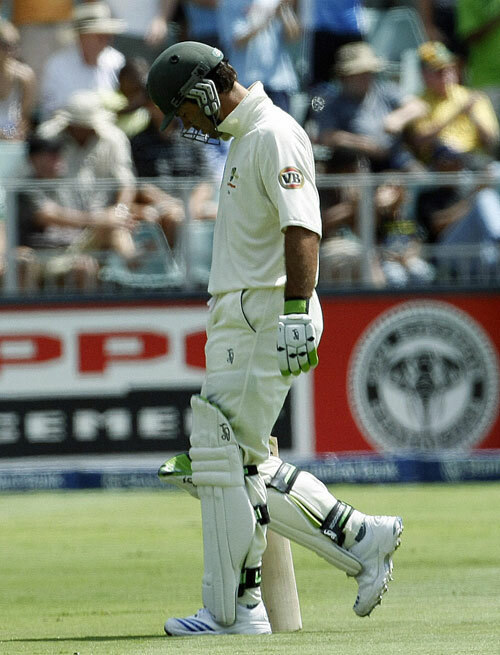 Just as the First Test was beginning to organise itself into a contest where victory for the hosts looked improbable if not impossible, things swung right back around, Jacques Kallis taking 3-22 (the 3 in question being Ponting, Hussey and North) and Ntini 3-52 as Australia’s second innings was brought to an end with just 207 added to their lead. 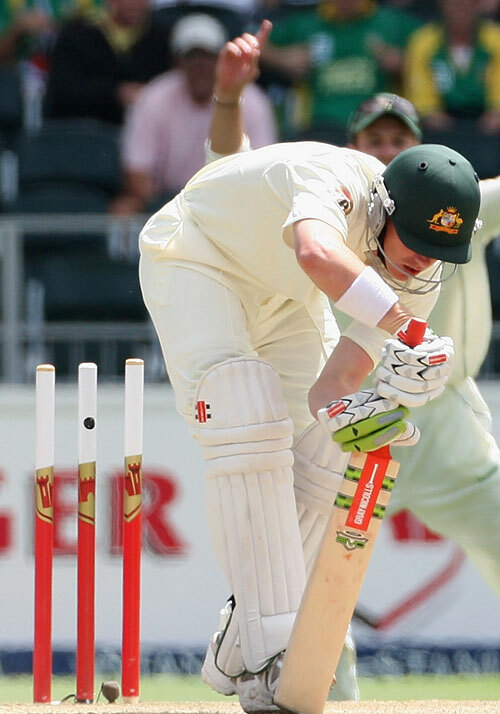 The tourists still enjoyed a lead of 454 at this point, but recent events Down Under (and before that, during England’s tour of India) have moved the goalposts, so to speak, for fourth-innings run chases. 276 from 98 overs tomorrow is now well within the realm of the possible. If Ricky Ponting has a nagging feeling of deja vu, it’s most likely due to what happened in Perth last December, where South Africa overcame a first-innings deficit to claim victory with a ridiculous 414/4 in the fourth innings. Whilst the Saffers have a lot more left to do on the final day this time around, stranger things have happened (and many of them in the last twelve months). The brief interlude of the two Twenty20 matches between the Test series and the ODIs, combined with the absence of Graeme Smith, seems to have taken the wind out of South Africa’s sails a little. 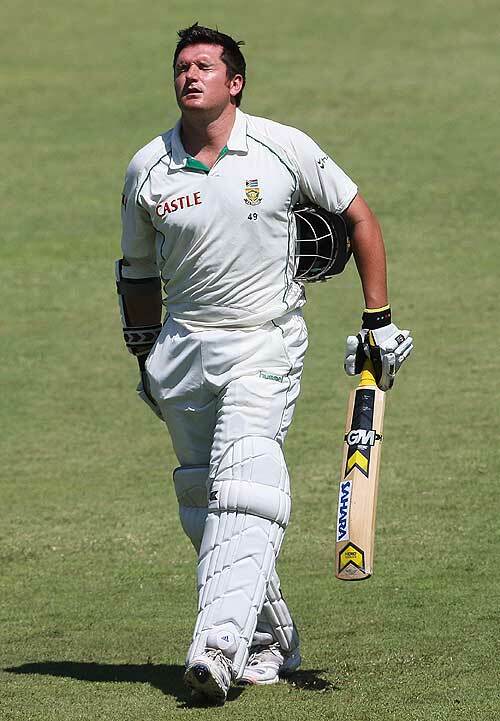 As well as the two defeats, stand-in captain Johan Botha also has the headache of slow over rates to deal with – he was fined 10% of his match fee on Tuesday for Saffer tardiness in the field. Botha can at least console himself with the knowledge that AB deVilliers and Jacques Kallis have both recovered from the injuries which kept them out of the second Twenty20 match, and with the good form of JP Duminy, who’ll be looking to make some big scores following a disappointing ODI series in England. Australia, meanwhile, are brimming with regained confidence in the shorter form, and will be looking to capitalise on their Twenty20 success as the series moves on to 50-over matches. The two teams haven’t actually met in an ODI since the last World Cup, and Australia’s last defeat to South Africa was the celebrated run-fest in Johannesburg, when even 434/4 from 50 overs wasn’t enough to secure victory for the Aussies. The most interesting sub-plot in the ODI series is the question of who will open the batting for Australia alongside Shaun Marsh. Michael Clarke is a strong possibility, as is James Hopes, but it’s also possible that someone could come out of left field to make the slot their own.